Launched in 1973, the Honda Civic is a well-known family hatchback with an establish reputation and a range of diesel and petrol engines. Since it was first introduced to the market, the car has undergone various updates, including changes to the steering and the suspension in 2014. More recently with has suffered other changes such as revised rear spoiler, a reshaped bumper and new headlamps with LED daytime running lights – all of them available for the Civic Sport trim. Buyers will also benefit from its impressive equipment. The Honda Civil come in basic S spec, mid-level SE Plus, SR and high-end EX Plus as well as a Sport model. Sat-nav and Bluetooth are standard on EX Plus and SR models and are optional to the S, SE Plus and Sport models. In terms of engines, there are three different options – a 1.6 diesel offering 78.5mpg, a petrol entry-level 1.4-litre or the stronger 1.8 i-VTEC. Across the entire Honda Civic line-up, a stop-start tech comes as standard – it shuts down the engine when you stop, thus helps to save fuel and to make the car more efficient. In addition, the ECON button adjusts air-conditioning usage and throttle response to further improve fuel economy. Thanks to the rounded rear end, the short bonnet and the bulbous body, the Civic doesn't look like any other car in the market. Driving this car is very comfortable, it is nice and quiet on the road which adds to the overall relaxing feel. Although the Civic does not offer a hybrid model, the costs on the diesel engine are pretty low. The 1.4-litre i-VTEC petrol engine returns 52.3mpg and emits 129g/km of CO2, and the 1.8 i-VTEC gets 48.7mpg. If are you interested in this car, we have used Honda Civics' on finance at 50 per month. On the market is this Honda CIVIC incorporating Automatic transmission with a 1.8L Petrol engine. At the awesome price of £4,295 and manageable instalments at hand beginning at only £99.09 pm. Organise a viewing with the knowledgeable sales team at South London Car Sales and see what credit plans are at hand. Your affordable monthly payments could start off at only £99.09 per month. This second-hand Hatchback from Cargiant features Manual transmission, a 1300 cc Petrol engine and has clocked up 16092 miles. Why not give yourself the kind of reassurance you'll feel in owning one of 2017's top 20, most dependable motors and be the next happy driver of this Honda. Are you considering a Honda? Consider this second hand one with low mileage from Cargiant in London. This CIVIC has a lot going for it, with its low mileage of 10567 miles driven and having only been driven for less than a full year. Get in touch with one of their knowledgeable advisers for more info and to book a test drive. This Honda CIVIC up for sale priced at £8,999 has done 70556 miles and is finished in the shade of Red. This motor can be bought in the London area. Contact this dealership directly to find out more by having a chat with a member of their knowledgeable sales team. Incorporating a 1800 CC Petrol engine and Auto transmission, this second-hand CIVIC is available in Grey and has few miles on the dashboard. As you can expect of a high quality car from Honda, it provides its driver with a substantial amount of useful specifications and features, further enhancing your driving experience. Get in contact or drop in and visit the customer care office at Cargiant to organise a viewing. Best known for its durability this CIVIC 1.8 SE Plus has Manual transmission and a 1.8l Petrol engine. At the terrific price of only £9,999 or with the option to purchase on finance with achievable instalments on offer starting out at as little as £230.68 monthly. Call or email this dealership as soon as you can for more information on this CIVIC 1.8 SE Plus. This Honda CIVIC 1.6 i-DTEC SE Plus has a 1.6 ltr Diesel motor with Manual transmission and it has clocked up 37535 miles. Grab the chance today to purchase this Japanese motor. Up for sale and ready for you to take home for the total of £9,999. Get in touch with Cargiant to get more information or head on down to the dealership to go and see this motor in London. At just £11,999 is this CIVIC 1.6 i-DTEC SE Plus with low mileage. This second hand car is up for sale in London. Have a chat with the car dealer right away to organise a test drive. Finished in the tone of White, this motor has 18246 miles clocked-up on the dash and incorporates a Manual 1600CC engine running on Diesel. Our dealership's helpful team is available to help you. Call or email us today to schedule a test drive, get more info or to receive assistance in selecting the right vehicle for you. with Manual transmission and a 1400 cc Petrol engine. Contact us to make an appointment for a test drive. There's a bargain price at this dealership on this used, low mileage CIVIC 1.6 i-DTEC SR featuring Manual transmission with a 1600 cc Diesel engine. This CIVIC 1.6 i-DTEC SR has been so well maintained that it could be mistaken for a brand spanking new vehicle, it can be yours to own in no time at all. Fitted with a 1600cc Diesel motor and a Manual transmission, this trustworthy and very dependable CIVIC 1.6 i-DTEC SR is on the market in Grey with 50180mi on the dash. Get in touch with Cargiant to know more or head on down to the dealership to see this car in London. Test drive this trusty Honda which is ranked amongst Britain's top 20 reliability index. This second hand model currently in stock at our dealership in London has just 29234 miles on the clock. If this Honda is what you're looking for, do not miss out. Get more information about this vehicle from a member of our sales team before it is too late. Be the new owner of this durable Honda CIVIC 1.8 Sport which has a top 20 ranking for reliability. This second hand model from us at Cargiant has 16798 miles clocked up on the dash and has a Blue finish. 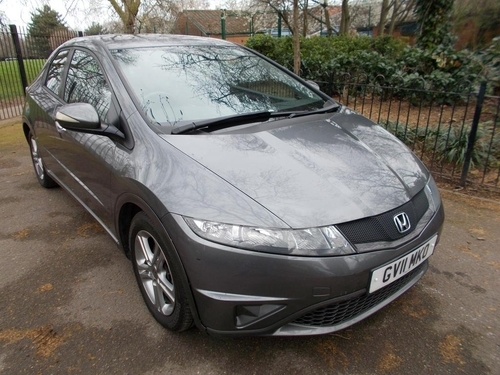 You could get this Honda CIVIC in the London area from this vendor with a loan. Instalment options begin at just £295.28 per month. A terrific price of £11,999 from us at Cargiant for this CIVIC 1.3 Sport with a low mileage of only 21477 miles. It could be the one for you if you're searching for a vehicle with a design that prioritises trustworthiness and reliability for its drivers. Pop down to Cargiant now and have a chat about this second hand car. This Honda CIVIC comes equipped with Manual transmission, a 1600CC Diesel engine and has clocked-up 75854 miles. Get this Hatchback Honda CIVIC 1.6 i-DTEC Sport. It's currently available on the market in London. Pay for it on finance. On the market and ready for its next owner to drive away is this second hand car at only £8,499. This dealership in London also provides you with the option to buy with achievable monthly repayments with instalment packages commencing at only £196.07 per month. You really will want to get over to our car dealership to look at this car to really get a feel of how it will be to own. Arrange a test drive before this second-hand CIVIC is gone. Just email or call our helpful customer care team. Showing 1-18 of 2,854 items.